Writing about a novel that spawned three sequels put me in state of confusion similar to that experienced by the main character in the series, Harry “Rabbit” Angstrom. I simply didn’t know where to start. Hindered by a big secret, the task ballooned in its challenge: All I knew was the beginning. I never read past book one. No, I didn’t abandon the story a quarter way through because I despised the protagonist or because disinterest crept into my psyche. Quite the opposite rang true. 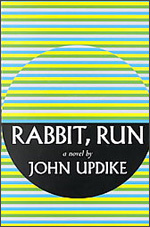 The writing contained some of the most impacting present tense in print, and exposure to the world of Rabbit, aged twenty-six with a nickname describing him in appearance and action, as he repeatedly ran scared over three tumultuous months, stole my imagination. I empathized and was repulsed at once by a grown man who hearkened back to his glory days as a high school basketball star in the ’50s for comfort and whose emptiness sent him on a spiritual quest, while he avoided adult responsibilities, including raising a family in suburban Mt. Judge, Pennsylvania. I can’t claim I identified per se, since I always sucked at sports, had never been married, and, raised Catholic, already confronted religion’s design to answer big picture questions. The era depicted was also well before my chromosomes joined together in Illinois hundreds of miles from where Memories Last(ed) a Lifetime. What struck me upon reading the book and what finally activated my fingers on the keyboard, however, circled back to the operative word beginnings. During the course of the narrative, Rabbit dodged pressures by literally running from the source of his problems with the expectation that he could get ahead of obstacles and set his life on a positive course with new beginnings. The revelation to which our (anti-) hero remained oblivious was the senselessness of the race. Specifically, early in the book, Rabbit ditched his pregnant wife and young son and aimlessly drove south into West Virginia. No comfort resulted from breaking free. The land refuses to change. The more he drives the more the region resembles the country around Mt. Judge. The same scruff on the embankments, the same weathered billboards for the same products you wondered anybody would ever want to buy. Disappointed in the monotony of the scenery, Rabbit returned home—back to the place he knew, back to his beginnings—with the passing observation discarded along the highway. Nevertheless, an inevitability that he’d make the same mistake sprang into every step in his scattered plight, and the repetition of the cycle played out again and again. Whenever the going got tough, Rabbit always sprinted around another blinded corner, ending up in the presence of his origins. The promise of starting over alluded him, but odd nobility sank into his unwillingness to quit fighting and seemingly command his life by remaining in motion. My conclusion was that the familiar sustained mankind. There weren’t any fresh starts. The imprint of our pasts can’t be erased, and the past colored every aspect of the future. Foolish, it was, extolling a life of new beginnings. Sexual conquests, graduations, weddings, anniversaries, deaths, and unstoppable New Year celebrations were blatant examples of turning points where the faithful anticipated transformation. In retrospect, these events and dates consistently turned into potent reminders that the single start of significance was the moment of birth. Anything that transpired from then until death comprised a variation of actions already set forth by uncontrollable circumstance. One day, I may dabble in the rest of Rabbit’s story, but my suspicion has been that the patterns laid out in the first novel punctuated the false vicissitudes of life throughout. Everything I desired to know was in the beginning. Starting over represented illusion, and only one definitive inception survived us all.